Home > KMS	> kMS ver. 1.2.190 – Small Changes and Events! kMS ver. 1.2.190 – Small Changes and Events! A small patch has been released, changing some stuff about party quests and Monster Park and giving us a couple of new events. They changed the experience and drop penalty system to have a smaller effect, although the old penalty if you were 21 levels above a monster will now be applied when you are 31 levels above them. Monster Park Extreme has been reopened! It is now available for levels 70 to 140, that’s great. This place is a really great place to train (or it was before, I haven’t tried this version yet). They also increased the number of party quests and Dimension Invades you can do per day from 5 back to 10. Each day, you can collect a 1 hour 1.5x Experience Coupon from Cassandra until March 20. You have to use it within 30 minutes of getting it or else it will expire. 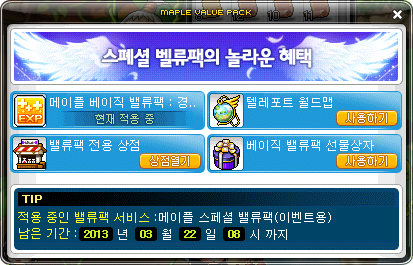 You’ll be able to collect a Maple Special Value Pack each day, once per world, until March 20. This is sort of like a light version of an item they sell in the Cash Shop on occasion. 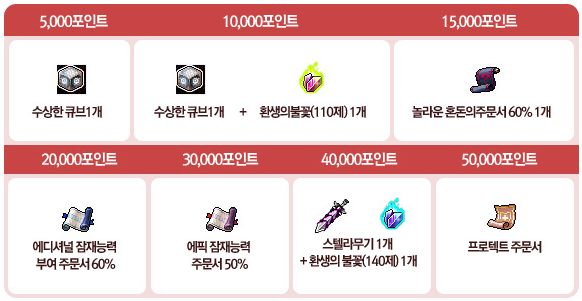 With this Value Pack, you’ll get a bonus of 20% experience from monsters as long as you have it, free usage of the Teleport World Map (with a 20 minute cooldown in between), a field shop (travelling salesman) as well as the Basic Value Pack Giftbox (gives 10 Power Elixirs). The Sweet and Sour Maple White Day event has begun and will run until March 20! Gain Candy Points by collecting candy from monsters around your level and use them to buy items in the White Day Gift Shop. 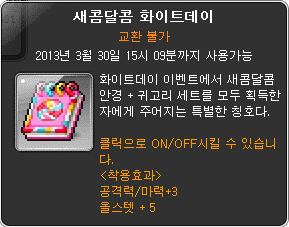 The White Day Sweet and Sour Glasses gives 3 to all stats, 1 attack and magic attack, with 3 slots. 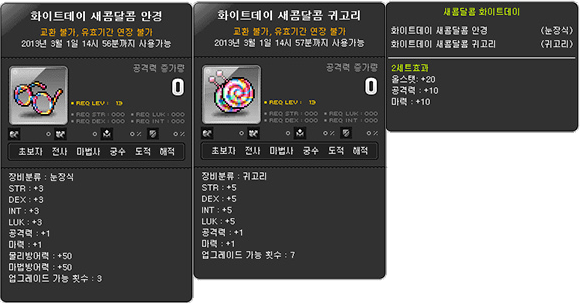 The White Day Sweet and Sour Earrings give 5 to all stats, 1 attack and magic attack, with 7 slots. They even have a set effect of 20 all stats, 10 attack and magic attack when you wear them together! Too bad they expire… haha. Finally, the 9th season of the Star Star Festival has begun, and will run until March 20! For those of you unfamiliar with this event, basically you have to log in and hold an item for 30 minutes in order to gain a stamp. You can get up to 5 stamps per day (if you miss some, you can catch up the next day). Very nice stamp system, gonna be a rush for the 1m. What do flames of reincarnation do again? That blue scroll looks nice. just tried the new monster park. its pretty good exp if u go in with a full party. Did they close mpe for lvl 40 to 100? I though u are korean max? Well GL guys. The only people who are able to achieve the amount of stamps in time are those who are willing to stay up all night and wait the the 2hrs 30min during Midnight. So you shouldn’t be too excited unless you plan to do it as well. And i doubt NA Nexon is going to do this event because of hackers who might again hack the system like during the free 2 cube event…. I am only aiming for those Protection scrolls. And maybe the recovery scrolls. What does the recovery scrolls do? I am getting tired of the hackers in GMS and that everyone gets punished for it. If HAD IT and if anyone agrees tell me. I don’t get what you are trying to point out Bodacious. I wasn’t able to comprehend the 2nd sentence of yours o3o. “If Had IT”, what is “IT”? Whith had it I am talking about the hackers. And come on. 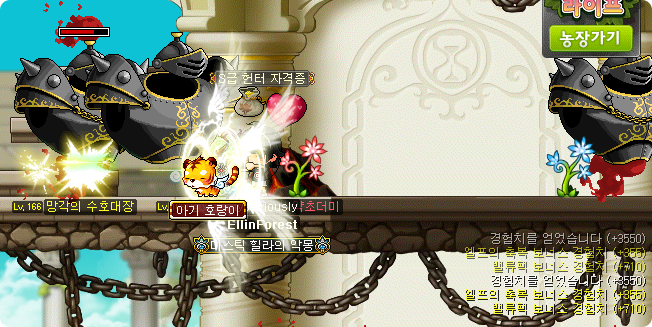 You know they are annoying and that Nexon shuold ban the hackers and their I.P instead of making a maintenance that cancels the event. Be the same anymore. Sorry. It wouldn’t add the last bit. They should just redo the entire exp system and make it as hard to level as before that one exp-curve pre-BB. Yes, the days when you only got 0.03% per monster at Lv37. And now, we can get back to feeling accomplished once again just by reaching lv70. March Update Preview! kMS ver. 1.2.189 – Golden Week and Cash Updates!